First off, sorry about that headline. I tried to fight the urge and I failed. Second, if you’re bummed that there’s no Super Mario game on the App Store (yet? 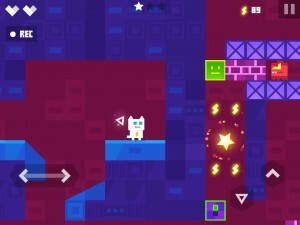 ), then you should drop what you’re doing and grab Veewo’s Super Phantom Cat ($1.99) right meow. It’s a fairly traditional platformer under the surface, borrowing heavily from Nintendo’s resident plumber, but I have to say–that surface is flippin’ gorgeous. In fact, game’s art is not quite like any game I’ve played on iOS before. The closest thing I can compare it to is Ridiculous Fishing ($2.99), with it’s colorfully angular visuals. Phantom Cat is a bit cleaner and brighter, though, and it’s quite striking. It’s slightly weird and more than a little beautiful, and really makes you feel like you’re in a strange new place. There’s plenty more to the game than just running from one side of the screen to the other, though. You’ll also be collecting “data” along the way, which sometimes function as coins for unlocking new characters. 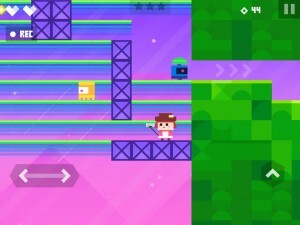 There are also hidden stars in each level, and a standard 3-star system for beating levels and unlocking new ones. And speaking of hidden stuff, each level is jam packed with secrets, and your basic rule of thumb while playing should be to never trust that any particular wall is solid. As I said, most levels are cleverly designed with one of these sprites in mind. For instance, you’ll find levels for the teleporter that contain lots of closed off passageways for you to zap into, and levels for the bullet sprite that are made almost entirely out of destructible bricks, forcing you to blast your own way through. Even apart from that, the level design in general is absolutely top-notch. In fact, I’d go so far as to say the game has some of the best designed levels I’ve ever seen in a mobile platformer, with tons of areas to explore and just the right amount of puzzle-y-ness to keep you on your toes. 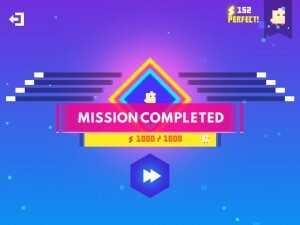 With its sharp and colorful visuals and classic gameplay sensibilities, Super Phantom Cat is a pretty perfect hybrid of the new and old. That doesn’t mean the game itself is perfect, though, as there were moments when I wished the developers had been as creative with the platforming genre as they’d been with the art. (Wondercat Adventures ($2.99) comes to mind as a good example of a cat-themed platformer that thinks outside the box a bit more.) Still, the level designs are brilliant and the unlockable characters are a nice carrot on a stick to keep you playing. Most important, the game is a ton of fun and feels great to play. So what if it’s not that original? You love Mario and you love cats. What’s the problem? Super Phantom Cat - Be a jumping bro.